Yellowfin Tuna can be found worldwide in tropical and subtropical locations, except in the Mediterranean Sea. It is epipelagic which means it is found in the ocean stratum where photosynthesis can still occur because enough light is present. Yellow Fin found in the Eastern Tropical Pacific provide approximately 1/4 of the total catch of this fishery. Theses fish can be found above and below the thermocline, at a thermal boundary of 18-31 degrees Celsius. 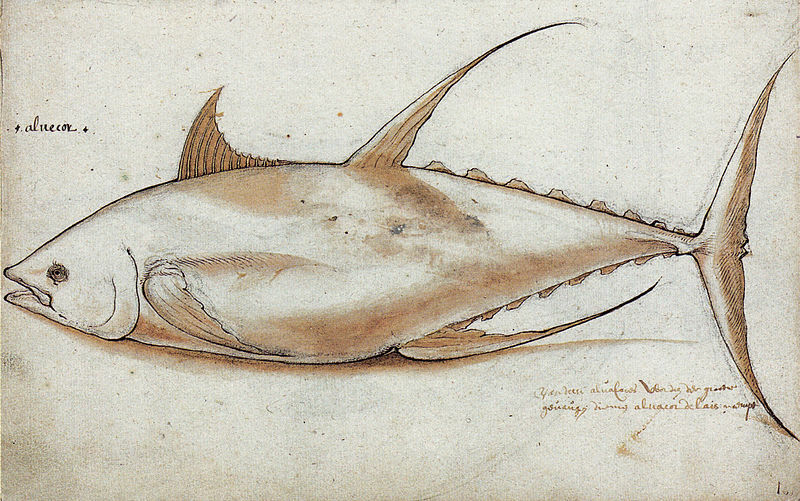 Many different techniques of fishing Yellowfin Tuna have been used throughout history. Some of these types include; bait boating, gill nets, trawling, longlining, artisanal, and purse seining. Only a few remain at large scales today. Bait boats used pole and line fishing with live bait such as anchovies and other forage fish. Pre- 1960, bait boats provided a majority of the Yellowfin Tuna catch. They died out in the 1960's but are still used in small numbers today. They do not account for a large quantity of Yellowfin caught, but have very low rates of bycatch. Most of the Tuna caught is canned for resale. However, the sashimi market for sushi requires high quality specimens. Longlines can be one to 50 miles in length and can be set at variable depths. The primary line is attached to smaller lines that contain baited hooks. Hooks attract a variety of marine life however, including sea turtles, seabirds, and sharks. Prevention measures such as streamers and sinking hooks faster to keep birds farther away, as well as using different types of hooks can help reduce this bycatch probelm. 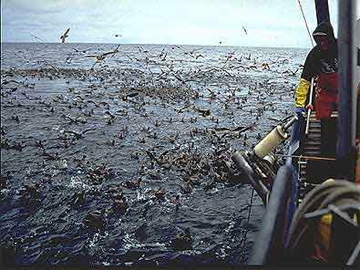 Before the innovation of streamers, seabird bycatch was a major issue with longline fishing. Logging requires the use of fish aggregating devices or FADs. These devices can be anything from logs (as the name suggests) to intricate man made devices. FADs can be anchored to the ocean bottom or can be free floating. High amounts of bycatch are associated with FADs as explained by a helicopter pilot below. This method also tends to catch immature or juvenile tuna, and is therefore responsible for further depletion of tuna stocks. Schooling is the method in which Yellowfin Tuna are spotted visually near the surface usually by helicopter or small plane that then directs a fishing vessel to their location. This method is also responsible for the capture of sexually immature individuals. Large tuna are often associated with a wide variety of dolphin species. Since dolphins are mammals and must surface to breath, they make visibility for fishermen possible. The two main benefits of tis type of fishing are the ability to catch sexually mature fish, and a larger average catch size. However, when it was first implemented dolphin mortality occurred at high rates. To revert to the other two options could have large scale effect on the conservation of tuna populations, so in 1972 the Marine Mammal Protection Act sought to reduce dolphin mortality to an absolute zero. 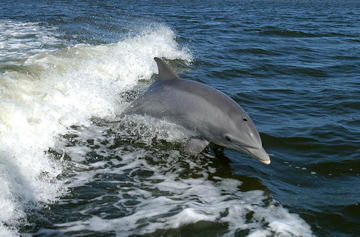 The development of the porpoise panel allowed for the release of some dolphins, but it was not until use of the backdown procedure that dolphin mortality was curtailed. During the backdown procedure, tuna and dolphins alike are purse seined. Then the back of the net is lowered into the water to allow the dolphins on the top to be released. This led to the certification of canned tuna as dolphin safe, meaning that no dolphins were caught as bycatch while fishing for these elusive tuna. By the 1990's, canneries stopped purchasing tuna that was not dolphin safe. This caused a shift in the U.S. fishery to lower regulation areas such as Mexico and caused a spike in dolphin morality rates. Both populations of Yellowfin Tuna in the Atlantic and Pacific are considered healthy. Measures have still been taken however to limit catch size in order to maintain sustainability. There are several components that must be taken into consideration while trying to manage this species. Yellowfin tuna are highly migratory making management and regulation an international issue. Different conservation efforts are in place in different areas of the world. More than seventy nations participate in the Yellowfin tuna fishery but only ten of these nations account for a majority of the catch. Cooperation between nations is required for successful and sustainable management practices. The Western and Central Pacific Fisheries Commission and the Inter-American Tropical Tuna Commission are the Regional Fishery Management Organizations responsible for the Pacific Yellowfin tuna, along with NOAA Fisheries and local management councils. The Atlantic yellowfin is managed by NOAA as well as the International Commission for the Conservation of Atlantic Tunas and other organizations. Although these populations are considered healthy it is important to continue international efforts to maintain sustainability of this species. Use of sustainable fishing practices such as dolphin purse seining with backdown procedure will ensure that this species continues to thrive for years to come. (1) Dolphins and the Tuna Industry. Washington, D.C: National Academy Press, 1992. Print. (2)"Pacific Yellowfin Tuna." Fish Watch-U.S. Seafood Facts. National Oceanic and Atmospheric Administration, 24 October 2011. Web. 5 Dec 2011. (3)"Atlantic Yellowfin Tuna." Fish Watch-U.S. Seafood Facts. National Oceanic and Atmospheric Administration, 7 July 2011. Web. 5 Dec 2011. <http://www.nmfs.noaa.gov/fishwatch/species/atl_yellowfin.htm>. (4)Morgan, A.C. 2011. Fish Aggregating Devices and Tuna: Impacts and Management Options. Ocean Science Division, Pew Environment Group, Washington, DC. (6)Wikipedia. Yellowfin Tuna. Updated 4 Dec 2011. Web. 5 Dec 2011. (7)Coan, Atillo L. . "California’s Living Marine Resources and Their Utilization Eastern Pacific Yellowfin Tuna." . N.p., 26 June 2000. Web. 5 Dec 2011. <http://swfsc.noaa.gov/uploadedFiles/Divisions/FRD/Fishery_Monitoring/Tuna/yfweb00.pdf>. (8)Gardieff, Susie. "Education Biological Profiles: Yellowfin Tuna." Ichthyology . Florida Museum of Natural History, n.d. Web. 5 Dec 2011. <http://www.flmnh.ufl.edu/fish/gallery/descript/yellowfintuna/yellowfintuna.html>. (9)http://www.youtube.com/watch?v=6JlKwoUtMk4 Geenpeacevideo. "Helicopter Pilot Blows Whistle on Tuna Industry." Youtube. 16 Nov 2011. 5 December 2011. (10) "Thunnus albacares (Bonnaterre, 1788) ." Species Fact Sheets. Fisheries and Aquaculture Organizations of the United Nations, n.d. Web. 5 Dec 2011. <http://www.fao.org/fishery/species/2497/en>.